Earlier this week, I wrote about my trip to Africa and what will truly be the trip of a lifetime. I’m taking my parents and Kate and Cliff from the TPG team to Accra, Ghana, for a PeaceJam conference with 450 PeaceJammers and Nobel Peace Prize winner Leymah Gbowee. From there, my parents and I will head on to Ethiopia and Tanzania in an effort to witness the Great Migration in the Serengeti. I’m so incredibly thrilled — especially to have my parents alongside me for the whole trip. But in order to get the trip in Africa started, we had to cross the Atlantic. 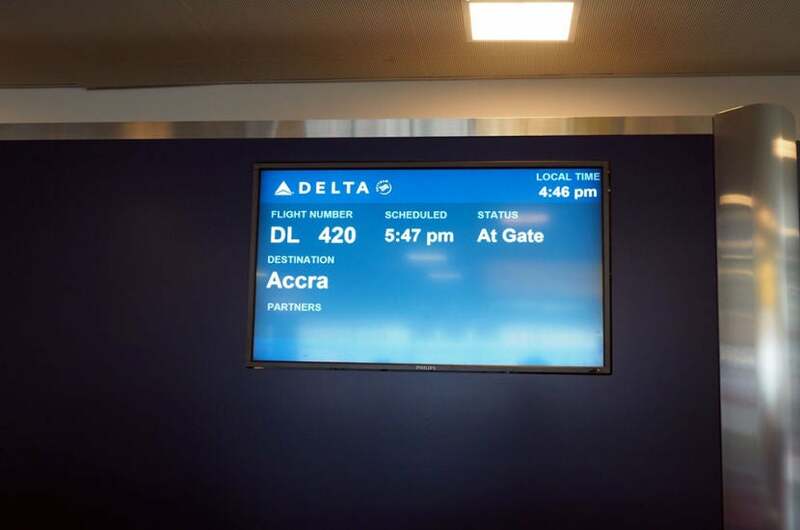 On my last trip to Accra, I flew Delta’s nonstop route from New York (JFK) to Accra (ACC) and enjoyed the experience — you can see more of my experience in Episode 1 of TPGtv. Knowing that and how convenient the route is, I chose to fly it again. 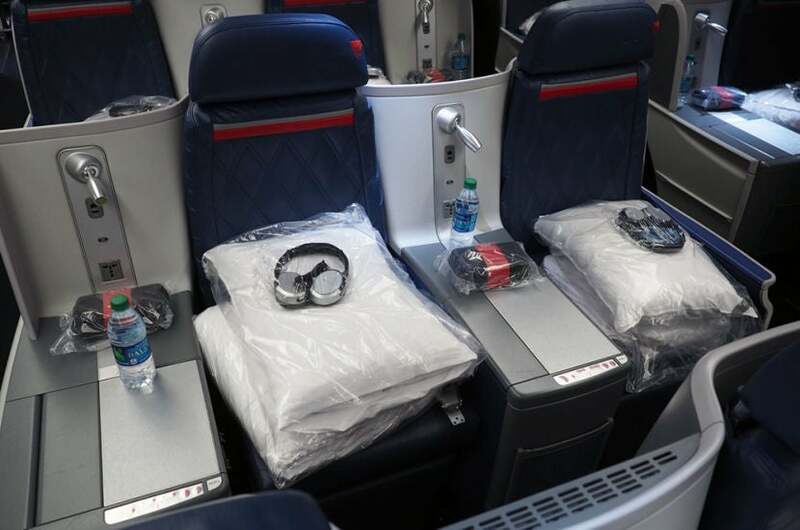 Delta has a solid business-class product, Delta One, which, in general, is superior at least when compared to the other US carriers’ international products — although American’s business class on the 77W is a much more spacious seat. But, in general, the Delta experience from the lounge to the plane and food is better than any other carrier when traveling nonstop to Africa, in my opinion. Delta’s nonstop route between JFK and ACC. The JFK-ACC route is wildly convenient — it’s one of the few nonstop flights you can take from New York to Africa. Not only is it nonstop, but the timing works out perfectly, as you leave JFK just before 5:00pm and arrive in Accra around 8:30am the following day. I paid 70,000 SkyMiles and $5.60 for my one-way Delta One ticket to Accra. I booked six one-way tickets in Delta One for me, my parents and TPG and PeaceJam members — and get this, they were only 70,000 SkyMiles + $5.60 in taxes and fees each. I was low on SkyMiles so I transferred them in from Amex Membership Rewards (boy, do I miss the days of Amex to Delta transfer bonuses!). But luckily I earn a ton of Amex points from putting all of TPG’s internet advertising on the Business Gold Rewards Card, which gets 3x in a category of your choice, including advertising on select media. I also earn a lot of Membership Rewards from putting almost all of our flights on the Premier Rewards Gold Card from American Express for 3x points on airfare when booked directly through the airline. 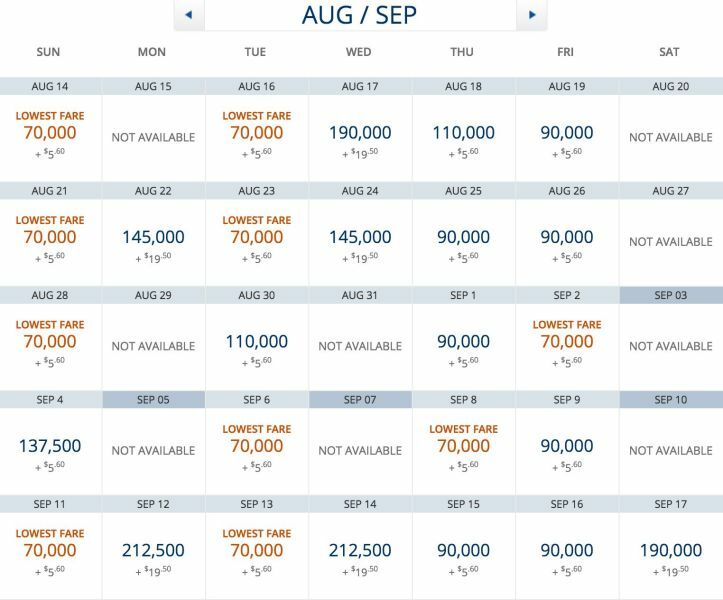 If you don’t have any Delta SkyMiles or Amex points, you can get the Platinum Delta SkyMiles Credit Card for 60,000 miles after $2,000 in the first three months, or the Gold Delta SkyMiles Credit Card for 50,000 miles after spending $2,000 in the first three months — either of which, when coupled with the points from the required spend, would almost get you a free one-way business-class flight flight to Africa. An extremely important detail when booking flights to Africa through Delta is that you must have the credit card that you used when booking the ticket with you when you check in at the airport — even if it’s an award ticket and you just used the card to pay taxes and fees. If you don’t have the exact card you used, you won’t be able to check in — the reasoning being instances of fraud. If you’re booking a ticket for someone else, make sure you use their credit card to pay the taxes and fees so they can successfully check in at the airport without needing your card present. For example, my parents had to wait for me by the counter at the terminal in order to check in. 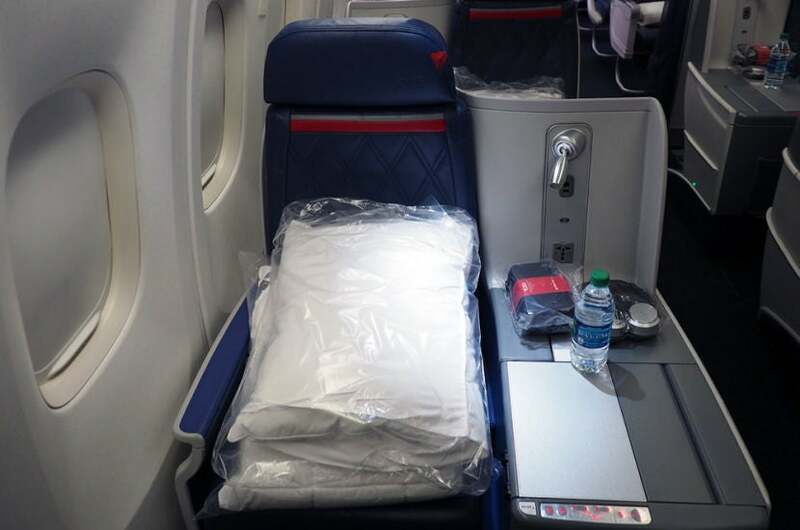 Delta One award availability from JFK-ACC in August and September. The 70,000-mile + $5.60 redemption from New York to Ghana is an amazing value, considering the one-way ticket when paid with cash is $4,932. Flying one of these nonstop flights is one of the best uses of Delta SkyMiles. There’s also pretty good availability through the rest of the year. In order to get checked in and to the gate, you must remember the credit card you booked the trip with. I want to reiterate how important it is that you have the correct credit card with you when you go to check in at the airport if you’re flying to Africa. I asked Delta via Twitter what would happen if you canceled your credit card and no longer use it, and the representative said you must have your card and sounded like they will make zero exceptions. If you don’t have your card, the check-in process will not be smooth and you’re easily at risk of missing your flight — especially if you’re in a city like New York where you have to hope there’s no traffic when traveling between your home and the airport. That being said, I did remember mine so the check-in process was a breeze once I was able to give the agent my credit card. From there, I headed for security and the TSA PreCheck line was next to nothing. On these international trips, it’s extremely beneficial to have Global Entry because not only will I get expedited screening when I come back to the US, but it also comes with TSA PreCheck, so I was able to get through security quickly. Don’t forget there are several credit cards that come with Global Entry fee credits, such as the The Platinum Card® from American Express and the Citi Prestige. While JFK is a less than desirable airport for a host of reasons, flying out of Delta Terminal 4 is a breeze, especially if you’re SkyPriority. While I’m not a huge fan of domestic airport lounges, the Delta Sky Club and its Sky Deck is a haven for aviation geeks like myself because you can have a beer or cocktail and watch planes take off. It was a beautiful day out, so we got a table and I did my Facebook Live (see below) — and there was live jazz music, which was kind of cute. Delta One passengers used to get a separate food sampler coupon when they checked in, but Delta no longer does that. When we got there, the lounge was busy, but not too crowded. I contacted Delta before the flight and asked if we could board early to take pictures of the empty aircraft, and they agreed. So about 10 minutes before boarding was set to begin, the agents called us up to board early, which was a treat and the crew couldn’t have been nicer. While we were on board before the rest of the passengers, I had some time to explore the different cabins and seats. Unicorn sighting ahead: TPG in coach! 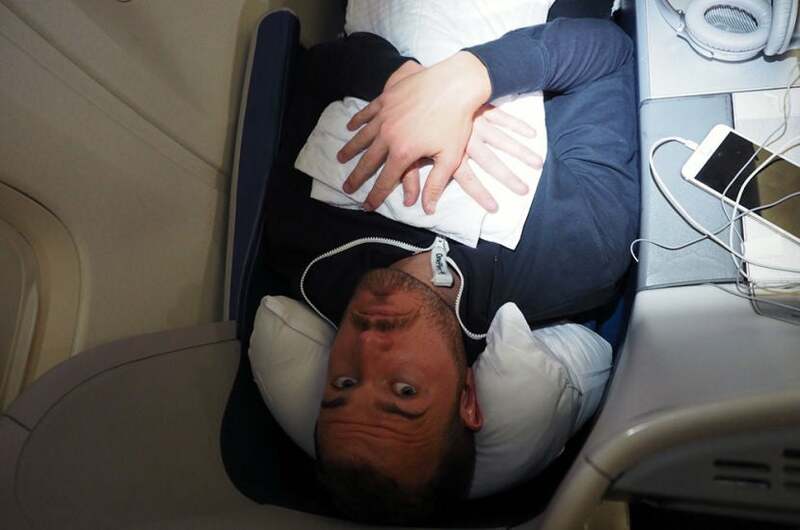 10 hours in economy as someone who’s 6’7″ is not ideal. 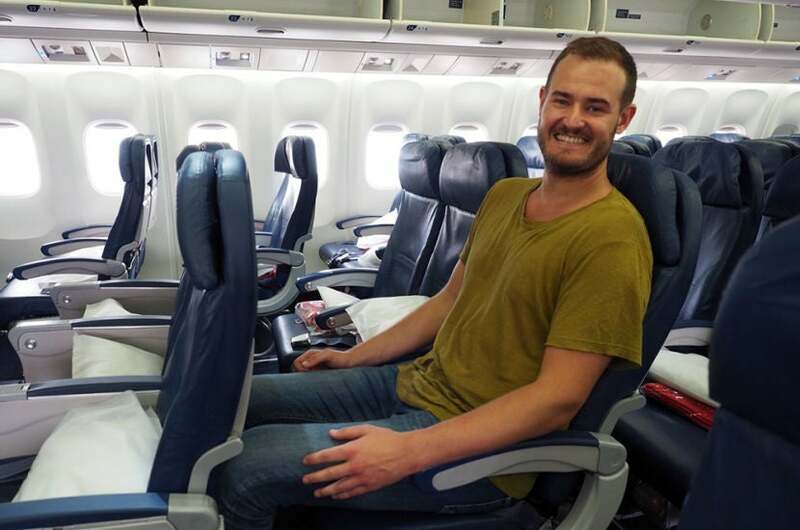 The economy seats were tight — I don’t think I could ever do it for a 10-hour flight. The 143 seats are in a 2-3-2 configuration, and each seat has 31-32 inches of pitch and is 17.9 inches wide. But, the Delta Comfort+ seats were actually pretty roomy. The seats themselves are the same as coach, but there is more recline and more legroom. The Delta Comfort+ cabin has 32 seats in a 2-3-2 configuration, and each seat comes with 35 inches of pitch and is 17.9 inches wide. 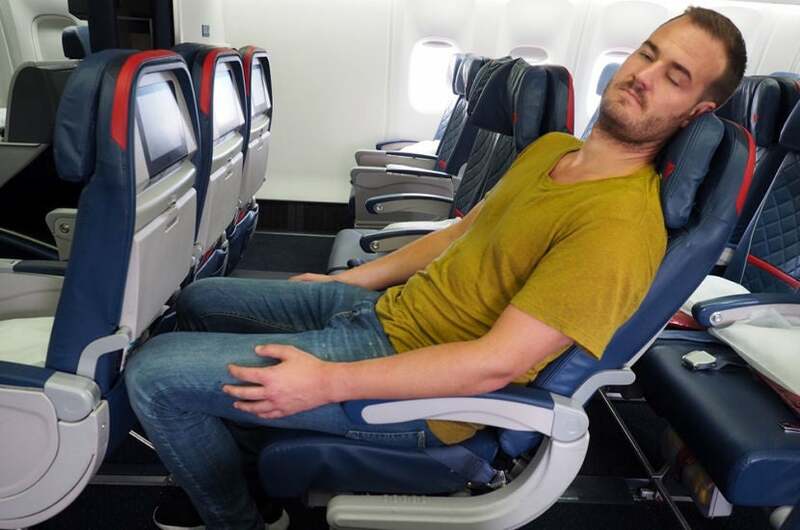 Comfort+ seats are the same as economy but with more legroom and recline. I’d rather fly an economy plus product nonstop from New York to Africa than stop in Europe on the way there, which adds a huge amount of time on to your trip. Once again, the convenience on the Delta flight and the low taxes and fees on awards are a major plus. Thankfully, flying in economy plus wasn’t an issue for me as I was in the front cabin in Delta One. Delta One 767-300 business-class seat. My seat was really comfortable. 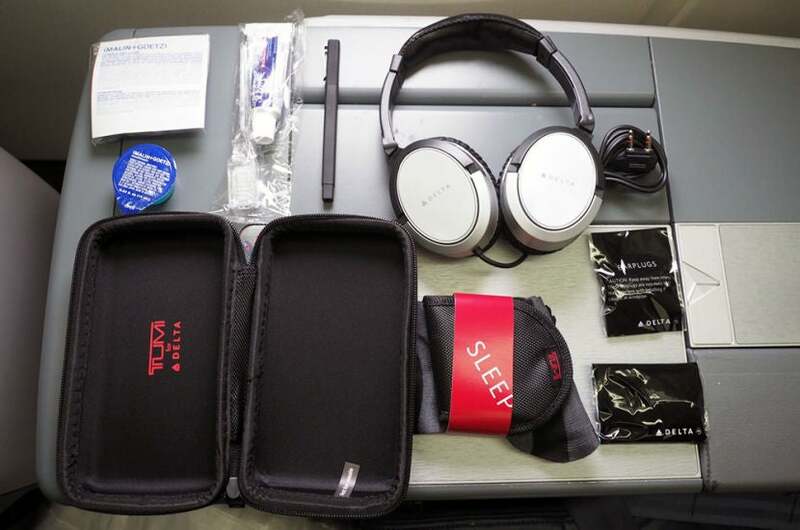 When we boarded, each seat had its Tumi amenity kit, bottle of water, pillow, blanket and set of headphones. A tip if you fly on this aircraft in business class: window seats in the odd-numbered rows are flush against the window and I highly recommend them. I also suggest seat 1A because I think it has more room in the footwell, which comes in handy when you have size 14 feet. I just think it’s more spacious. It is near the galley, but I didn’t notice any galley noise. 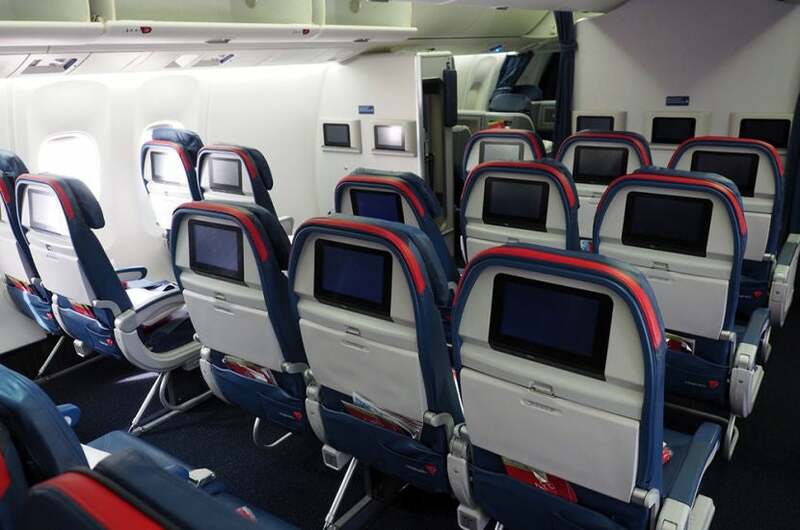 A two-seat row in the Delta One cabin. The Delta One cabin has 36 lie-flat seats in a 1-2-1 configuration. Each seat has 76.5-81.4 inches of pitch and is each 21 inches wide. 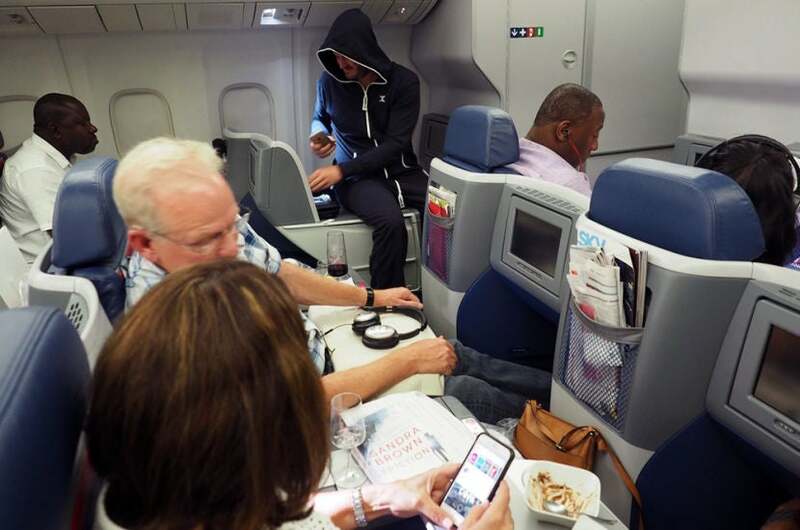 My friend got me a One Piece onesie for my birthday and I wore it on the flight for the first time. It was actually warm — I didn’t need a blanket for most of the night — and it was really comfortable. What do you think of my onesie? Is this a ridiculous look or who cares because it’s comfy? The bed is a bit of a tight squeeze. When reclined to the lie-flat position, the bed is tight. It’s not really meant for people bigger than 6 feet tall or those with broad shoulders. But, I sleep on my side and I was exhausted, so I slept for a good five or six hours on the flight. Good thing I sleep on my side. Overall, the seat was comfy, especially while sitting up. But when you do recline it to the lie-flat position, you’ll definitely feel a bit squished if you’re tall or have broad shoulders. 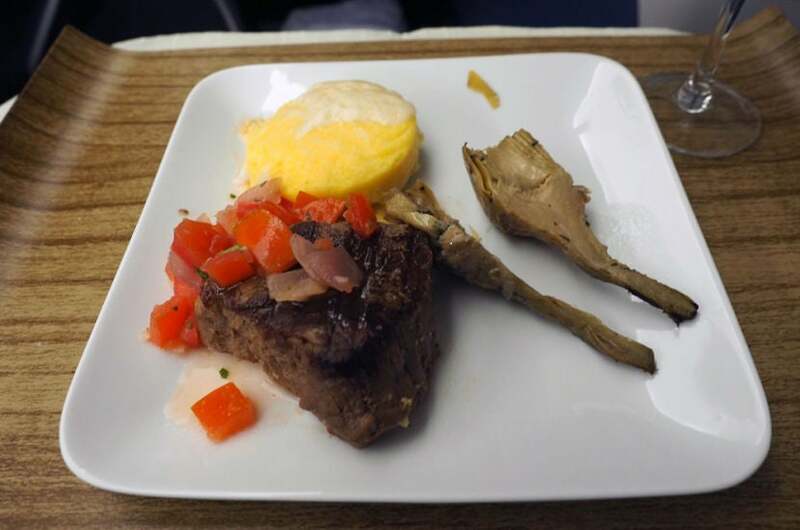 The food service on this flight was solid, though the three-course meal took more than two hours from takeoff (they also have an expedited meal service for those that don’t want the full dining). Be warned: come with an empty stomach because there’s a lot of food on this flight. The shrimp was a nice way to get the flight started. 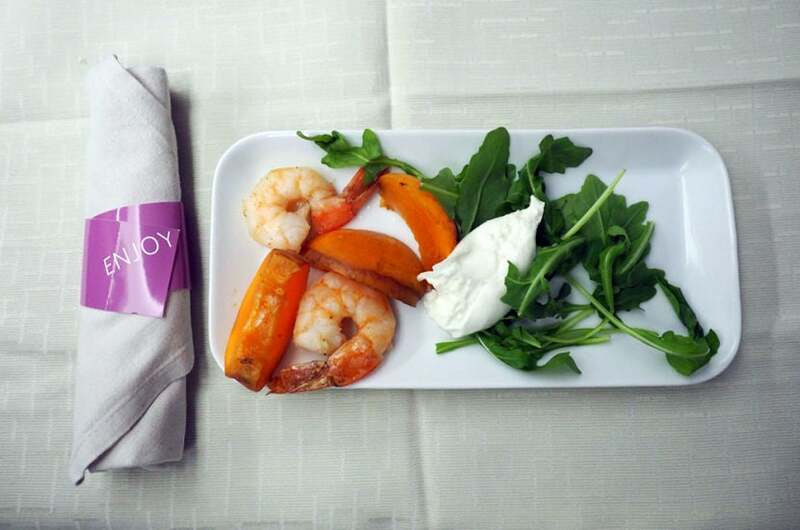 Grilled shrimp and apricots with burratina cheese and arugula was a nice start to a 10-hour flight. 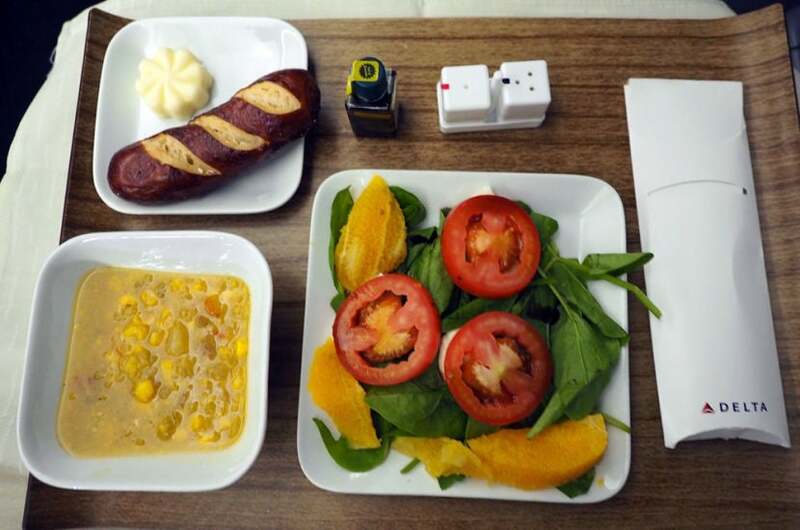 Delta does a three-course dining option — you get a starter, main course and dessert, as well as a breakfast option when you’re near landing. I have to say, the highlight of the entire meal was the wine — I had a Sokol-Blosser Evolution from Oregon, which was really nice, and my dad and I both really loved the French E. Guigal Cotes du Rhone Rouge. Both of my starters were delicious. To start my meal, I had the corn and green chili bisque with cilantro lime sauce, which was delicious and tasted better than it looked. It also came with a summer tomato caprese salad with orange balsamic glaze, which was also really good. My beef was a little overcooked but still good. For the main course, I chose the grilled beef tenderloin, which was served with a fontina polenta cake, grilled artichokes and smoked tomato onion salad. The beef was ok, but a little overcooked, but the fontina polenta cake was delicious. Cliff’s vanilla ice cream sundae was good. 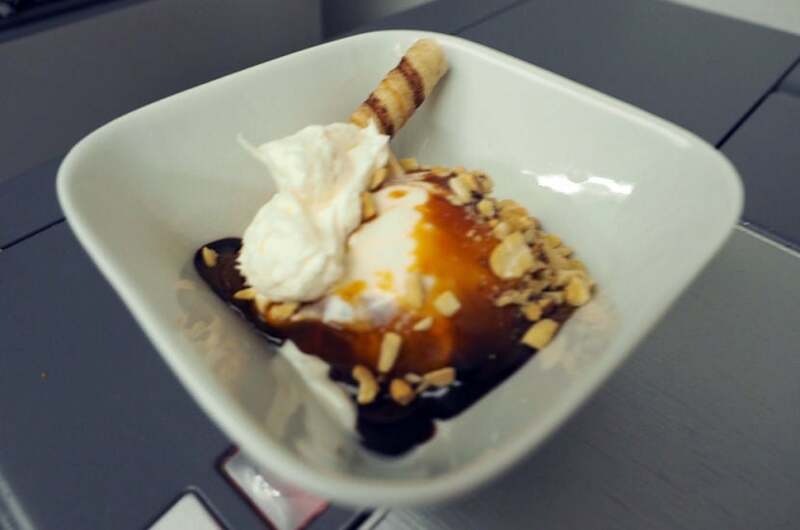 I opted not to eat dessert, but TPG VP of Marketing Cliff Fleiser did and got the vanilla ice cream sundae, which was served with choice of sauce, a wafer cookie and whipped cream. He said it was good. A nice way to wake up. 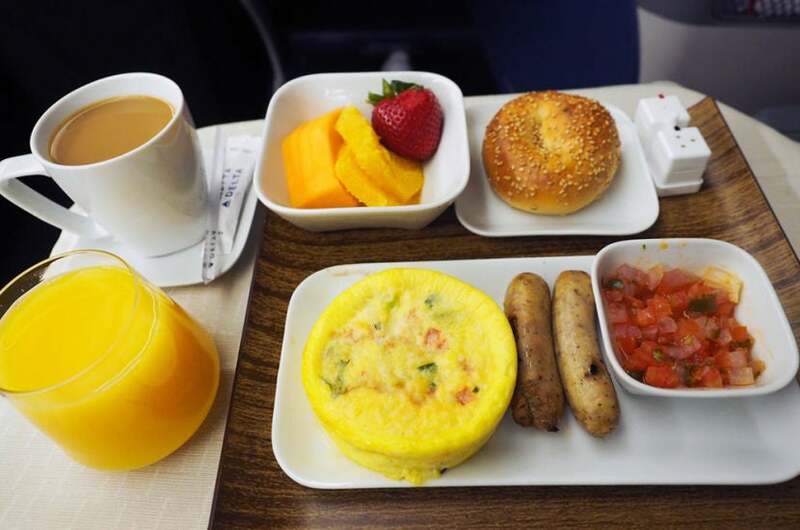 For breakfast, I chose the Southwestern frittata, which was served with warm pico de gallo, chicken apple sausage, fresh fruit, a sesame roll, orange juice and coffee. The meal was a nice way to wake up just before we began our descent into Accra. The contents of my Tumi amenity kit included all of the basics. Delta offers a Tumi amenity kit, which it has for a while now, and I see no reason for a change. I really like the durability of the case and Malin + Goetz products — it’s a quality amenity kit and there’s nothing that I would change about it. One downside I would say is the entertainment screen — it’s kind of small and far away from the seat. I had a hard time actually seeing the screen while seated. Side note: I watched “Selma” and it’s an incredible movie — and very fitting because Martin Luther King Jr. (who the movie is about) won the Nobel Peace Prize in 1964, and Leymah Gbowee (who we’ll be in Accra with for PeaceJam) won it in 2011. I highly recommend the movie if you’ve never seen it. The service was great, which is always surprising when flying US carriers. The flight attendants were all super friendly across the board, making sure we had a good experience. The service was so good on the flight that I was shocked when I went to the bathroom in the morning and the lavatory was actually clean. I’ve seen bathrooms filthy on many other American carriers because they never get cleaned during the flight — I’m used to seeing toilet paper on the floors. But the Delta One lav was very clean, so kudos to the staff for keeping it tidy throughout the 10-hour flight. Overall, the Delta One experience, especially out of New York with the Sky Deck, is terrific. If you can get the 70,000-SkyMile awards one-way in Delta One, it’s definitely worth taking advantage of. 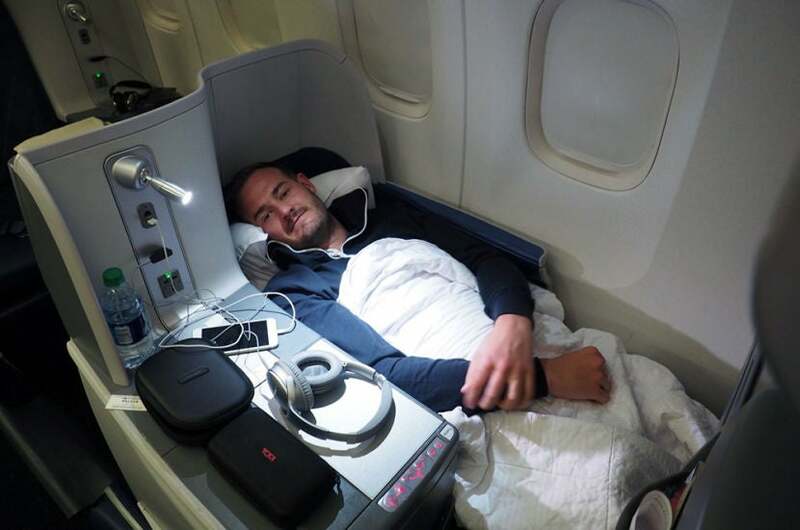 In general, it’s just a really convenient way to get to Ghana — the flight times are great, the crews are great and it really beats flying through Europe and spending more time having to travel to Africa. I really can’t recommend this flight enough, and my parents and those on the TPG team all had wonderful experiences as well. The flight was a really solid experience and I would definitely fly it again — in fact, I will probably fly it again because I’m going back to Ghana this fall. Have you flown on this route before? If so, what was your experience like? Also, what do you think of my onesie?